The backing is the fabric that is on the backside of the quilt. 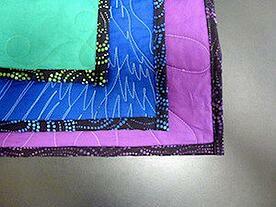 We use a solid color backing fabric so the quilting can be seen. Minky is a very soft and fuzzy fabric. You may have seen it with raised dots on it. (photo left). Michelle in our Austin, Tx location is the only Too Cool quilter experiencee using Minky. Minky will not show the quilting as much as a cotton fabric. Rather, you will see more of a shadow or indentation where the quilting is rather than a definite line. Minky is more expensive than cotton. It is difficult and it is very messy to work with and will cost a extra. Conact Michelle for more information. Austin@toocooltshirtquilts.com If you are ready to order, click here for Michelle's order form. 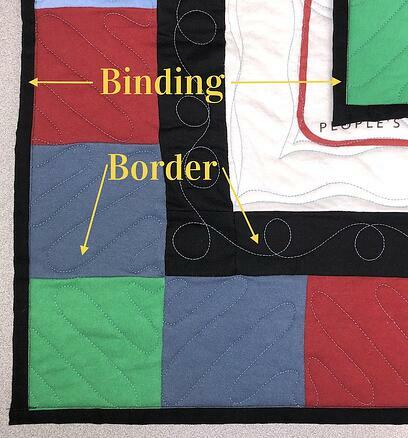 The binding is the material that goes around the outside of the quilt. It finishes off the quilt so the raw edges of the quilt top, the batting and the backing are all hidden. The binding can be the same color as the backing or it can be a contrasting color. For example, if the quilt is for a high school graduate, you can use the darker of the two school colors as the backing and the other school color as the binding. 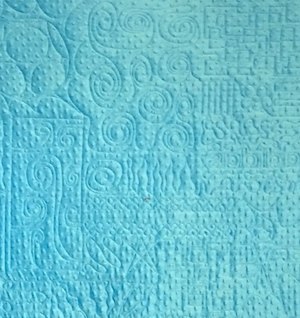 We also have print and batik batting - so your quilt can be a unique as you. The binding is different than a border. Read more about borders here.